I enjoy visiting the town of Crystal Cove and Jenna Hart, owner of the Cookbook Nook. In this story it is Christmastime in Crystal Cove and an old friend of the family shows up saying a friend of his has been murdered. Along with having to deal with a murder, Jenna's sister and her family are visiting for the holidays. So Jenna has a lot on her plate. This book was as good as the other Cookbook Nook Mysteries that I have read. Daryl's writing style is superb which makes the story flow well and kept me entertained throughout the book. There were just enough twists and turns to keep me guessing. I really enjoy the setting of this book and it was great visiting all the quirky characters that inhabit Crystal Cove. I have not read the whole series yet, but I will eventually get to them all and hope that there will be more in the series. 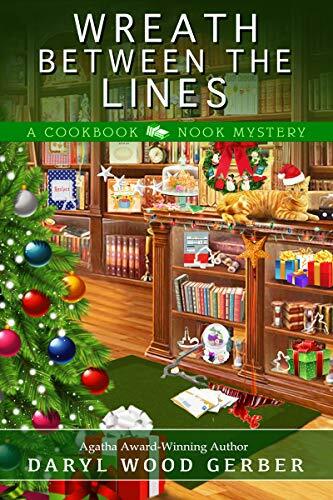 DARYL WOOD GERBER writes the nationally bestselling Cookbook Nook Mystery series featuring a cookbook store owner who is an avid reader and admitted foodie, set on the coast of California. As AVERY AAMES , she pens the Agatha Award-winning, nationally bestselling Cheese Shop Mystery series featuring a cheese shop owner amateur sleuth, set in the fictional town of Providence, Ohio. Daryl’s short stories have been nominated for the Agatha, Anthony, and other awards. Fun tidbit: as an actress, Daryl has appeared in “Murder, She Wrote” and more.